I am a “Transplanted Texan” that spent 10 years in California before moving to Amsterdam, the Netherlands and putting down roots in 2005, all for the love of a Dutch man, now my husband. I was raised in a small Texas town full of great cooks. These culinary mentors not only willingly shared their recipes but invited me into their kitchens and taught me the tricks of the trade, which without I could never recreate their signature dishes. Josephine Billeck’s many many cookies, buttermilk biscuits and her fried chicken (this one I still can’t make as good as hers but I keep trying), Nora Booth’s Potato Salad, Zita Grohmann’s kolaches and Chicken and Dumplins, Joyce Leppin’s Coconut Cream Pie and too many cakes to remember. 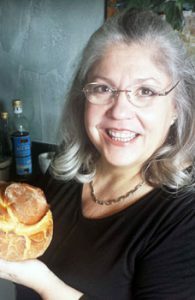 (Her Italian Cream and Hummingbird Cakes get me salivating with the mere mention on her name). My mom’s cheese cake, Betty Brashier’s Oatmeal cookies and sand tarts… these women plus many more along the way gave me my love of cooking and got me experimenting with all sorts of ingredients, local foods and produce. I adore living in Europe but those first years were unbearable missing family, friends and the customs and traditions once shared around the kitchen table. The Dutch winters were getting to me, I was lonely… I needed my favorite comfort food, COOKIES. I longed for a flavor packed cookie oozing with chocolate and nuts, but small so I would never feel guilty eating it or heaven forbid pack on winter kilos (if I ate 6 in one sitting). So I went into my kitchen, broke out that recipe box and started revising and experimenting. Abracadabra! My Signature Walnut Chocolate Chip cookies were created and I had my perfect comfort food. Quickly I packed up a box and took them too my “Iburgering” (Dutch culture & language integration) class. My fellow students inhaled them to mere crumbs within seconds, not minutes. They all wanted more and encouraged me to sell these explosions of chocolaty nutty goodness packed into a bite sized morsel. In fact Ale and Melissa pestered me conscientiously for months until they got me to realize I was meant to bake hence, Homemade Happiness was born. I can never thank these 2 ladies enough, for creating this amazingly happy world I now live in; making a living doing what I love. Over the years I added more goodies, savory items including so of those dishes I was so homesick for way back then. I am not trained chef. I am a talented baker and a damn good cook. What I do has rustic country look and taste. I use quality, fresh and mostly organic and free trade products. Feel free to bring me your serving dishes when it comes to items like the lasagnas or layered dips. I will fill them with goodness and you can serve them to your mother-in-law and she will never know you didn’t slave for hours in the kitchen cooking for her. Now in 2014 technology has brought me the luxury of an e-commerce platform (or Web-Store to us non-techies) filled with my “products”. Pick up the phone and call me if there is something you want and don’t see here. I may have it in my collection of recipes and if I don’t it is a good chance I can research it and make it for you. This is still a warm and fuzzy business just with technology bringing you the ease of ordering. Please call or e-mail me for some “down home” cooking made with love.